December 16, 2015 By heather 3 Comments This post may contain affiliate links. Read my disclosure policy. 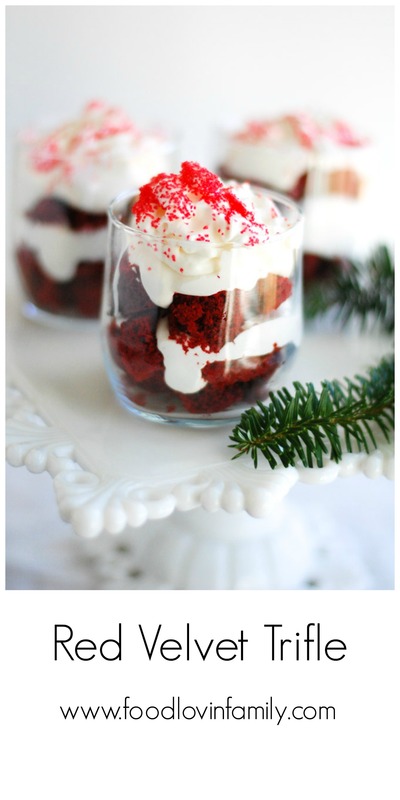 Red Velvet Trifle is made easy by using a cake mix, frozen whipped topping and cream cheese. A festive and delicious treat perfect for the holidays. Ten days left until Christmas and I still have some serious shopping that needs to happen. Even though it can get crazy sometimes, I love the build up to Christmas. The anticipation of seeing the kids smiles when they wake up gets me every time. One year for Christmas when Ava and Major were little, my mom came to stay with us so that we could get a little sleep. That was our Christmas present 🙂 She wanted to make us a meal and decided to make these sweet little red velvet trifles for dessert. The cream layer is part of the recipe for the Robert Redford dessert I posted several months ago. She just used a box cake mix to make it easy and then a little whipped cream for good measure. The cream mixture is so delicious, you could use it with any cake flavor. To make the trifles, make the cake as directed on the box. Mix together cream cheese, frozen whipped topping and sugar for the cream layer. You can put this in a trifle bowl or serve in individual cups. Be sure to check out the video tutorial here. Prepare red velvet cake according to box. Once cooled, cut the cake into small cubes. In a mixer, mix together cool whip, cream cheese, and sugar on medium speed. Mix about 5 minutes or until well blended. You can make these trifles in small cups or a large trifle bowl. Cover the bottom of the bowl with cake cubes. Add a layer of the cool whip mixture. Add another layer of cake cubes and then finish with the cool whip layer. Add whip cream on top of the trifle and then sprinkles. I love that you made them individual! I am a sucker for a dessert shooter and a trifle is so pretty! I love them because they are easy but I have to say that once people start digging into that large bowl it looks so messy. Having an individual one is so much better (not sharing) and better looking for sure!